Above: Napa Valley red, shown in 2 coats. This is a deep violet red or deep burgundy red-toned jelly base with coordinated glitter. No matter how many photos I took, they simply do not do this shade justice. Kim at Overall Beauty believes this is the best-selling one, and I can certainly understand that. Above & Below: Union Square, shown in just 1 coat! Unbelieveable coverage on this metallic bronze shimmer with what appears to be tiny silvery pink glitter. Below, with a matte top coat. Below: Mendocino Midnight has a special place in my heart, because I have always been partial to tealish green shades. I used 2 coats on this shade. It looks like a deep evergreen with hints of teal on the nail, and the small glitter reflects an emerald green sparkle in less direct lighting. As many of you know, the lovely Kelly from Vampy Varnish recently had the opportunity to work with BB Couture in developing her own polish collection. You can read about her experience and see her swatches here. 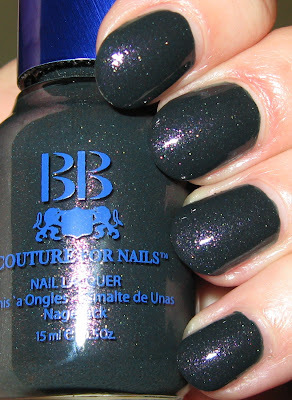 BB Couture polishes have always impressed me with their formula, their color selections, and their range of finishes. Combine that with Kelly's eye for color and style, and I knew these would not disappoint. I purchased mine from Kim at Overall Beauty last week. I happened to be on Twitter when Kim announced one of her fabulous sales...buy one get one free, limit 3 free. I jumped on that opportunity immediately, because it was only available for one day, and ordered the entire collection. This is the perfect trifecta of nail polish...the quality of BB Couture, the unique and beautiful polishes that Kelly designed, and the customer service of Overall Beauty! Congratulations to Kelly for doing such a wonderful job turning the colors in her imagination into such beautiful polishes! I LOVE LOVE LOVE this collection!!! I am so mad that I missed this sale :-( They look beautiful on you--thanks for posting them!!! I so badly want Napa Valley red! I will have to find out hot to get it to Europe :) It looks lovely on you. I love Mendocino Midnight! Gorgeous color! Damn I missed the Twitter sale! I can't get into my Twitter account at all. I had changed my user name because of spam. It worked for awhile and then nothing. I emailed them several times with no answer! Help, does anyone know what to do. I'm missing all the Twitter sales and specials. I ordered the whole collection as soon as they were up. I knew I would love them. They look gorgeous on you. Have a Happy New Year Mary! Your a darling. Napa Valley red is gorgeous. I think it's wonderful for her - still mad I missed the sale, but these are all gorgeous and I LOVE your swatches, Mary! Thank you. i only like napa valley red =/ if that photo doesn't so it justice, it must be so good in real life! Well favorite lady friends of Mary, Kim here from Overall Beauty! I was so crazy about the Vampy Varnish Collection that I did the sale just for the fun of it. I mis-understood the sale that BB Couture was having at the same time. In fact I like my misunderstanding of her deal better, you see she had it set up as buy one get one free same color.. opps I didn't say that, I just did BOGO for the day..
Next I do a sale I think I will let all the amazing bloggers tell the world for me so issues like my buddy Lucy had won't be the reason you miss a sale. itskarmababy~Kelly did a fantastic job with her shades. It is a beautiful collection. AllYouDesire~you *need* that shade! Overall Beauty ships to Europe, I'm certain they do. Get Nailed~isn't that pretty? Such a dark teal, but not too dark. Lucy~I don't know why you Twitter account would be doing that, but I don't know that much about it! 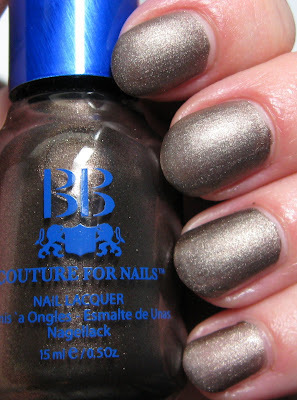 You will love these...I know you're a fan of BB Couture and these shades are so different and beautiful. Kelly~that one is definitely popular, understandably! Kae~I agree, very cool for Kelly. And for us, because I love the colors. Happy New Year to you, too! gildedangel~the really are pretty, and the quality is typical BB Couture...perfection! Phyrra~I couldn't take my eyes off of it. It is so sparkly and has such dimension...beautiful. Nicole~I am so happy I saw that sale, although I would've paid full price for them (and kicked myself for missing the sale!). hitomi~it's seriously stunning in real life!